Want to get your name or brand out there? One of the best ways to increase website visibility is to offer content. Yet while good content may get you noticed, it’s awesome online content that will get people remembering who you are and clicking over to your site. As such, you need to ask yourself if the content you have is link worthy. 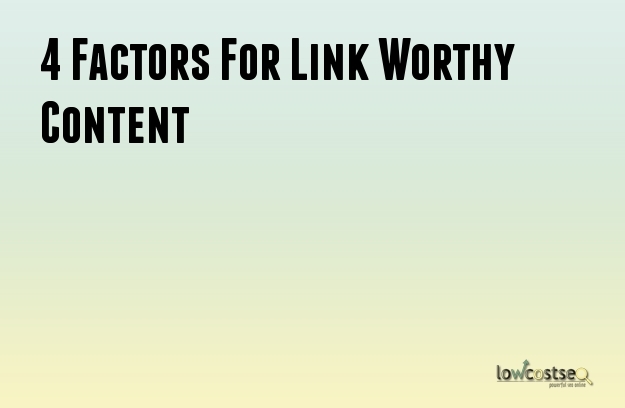 This can be a difficult task to do so, to help you, here are 5 key factors for link worthy content. This may prove to be a hard truth to face, but some content just isn’t relevant to your audience. Many company blogs like to share internal information, such as what their staff get up to changes in the office and, while a friendly face is certainly useful, this isn’t the content that will get shared. People want to hear about things that are either useful to them – answering questions that they’ve long had – or otherwise engages and entertains them. These are important factors. People wish to be informed and/or entertained, so make sure your content aims to do this. Does It Beat The Competition? These days, it’s hard to offer something that’s truly unique. Instead, simply focus on offering something that is better. In SEO, this is known as the skyscraper technique and refers to making content better than what is currently available. If someone offers 10 points about fashion, offer 15! Likewise, this is a great way to touch upon old subjects. Bring in a new angle, or offer an updated piece of content. In many niches, simply having something more relevant will make your content more useful. If you have a small backlog of content, examine this data to see what does and does not work. Here, you may find that articles, posts and videos on specific topics get more hits, shares and a lower bounce rate. On the other hand, you can also quickly find the pages that have little to no appeal. This way, you can better plan future content to match what you do. Does your audience respond to videos much more passionately than written posts? Try offering more media in the future. Don’t ignore such valuable data when its readily available at your finger tips. Similarly, what posts, videos or media are most likely to get shared? This depends on both the nature of your business and the nature of your audience. A clothes shop, for instance, could easily write fashion guides and other stylistic pieces, but a clothes shop that specialises in organic, fair trade clothing could also benefit from sharing more environmentally conscious and political content. It’s all about knowing what your audience wants to read. More specifically, it’s about knowing what the audience you’ve yet to generate wants to read. If it’s something gripping, there more likely to click through and encounter your brand! So, stick to these 4 factors and you’ll quickly start creating better content. When in doubt, ask yourself whether you would sit down and enjoy this content when browsing at your leisure?